Avidemux is designed for simple cutting, filtering and encoding tasks. It supports most common file formats including AVI, MP4, WMV, MKV and many more. Tasks can be automated using projects, job queues and powerful scripting tools. 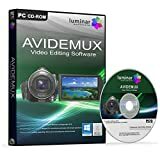 This entry was posted in Software and tagged Avidemux, Conversion, Editing, Movie, Powerful, Production, Software, Studio, Video by Computer Education World. Bookmark the permalink.